When you want to sit down and play an instrument, you might use a metronome to keep you on a consistent beat. If you’re covering a song, then the rest of the music is happening in your imagination, with a full band backing you up in your head. The ideal is to play with other musicians that jive with you and know how to stay on beat, but that’s not always readily available to everyone. 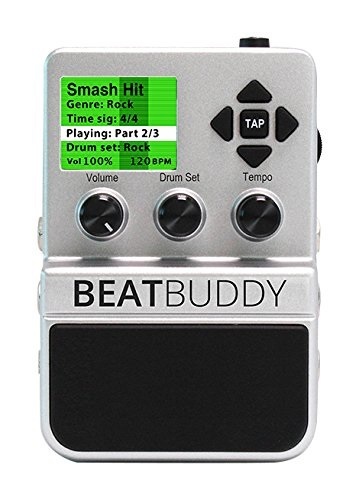 For those that want to practice with a realistic musical companion, the BeatBuddy could become your go-to. This is a drum machine in pedal form that will let you have creative control over the beat without forcing you to find a drummer with a set for every practice. This has over 200 songs in 21 genres that you can control, with 10 ultra-realistic drum sets included. It’s far more convenient than other drum machines since you don’t have to use your hands while playing to switch things up. There is a visual metronome on the LCD screen that makes it easy to improve your rhythm and learn new time signatures, as well as accessories that will let you further customize what you can do. You’ll be able to put in your own beats through an SD card slot, download songs from the BeatBuddy library, and add in loops and other effects with the MIDI Sync. It will take some getting used to, but this $299 device will give you everything you need to be a one man band.